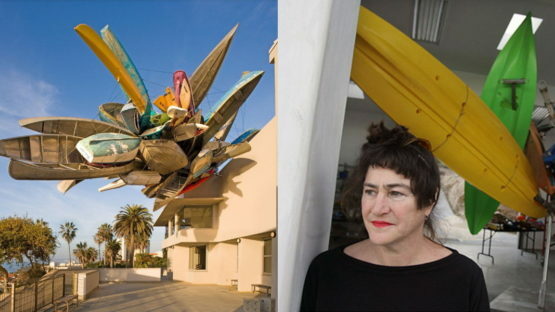 Nancy Rubins is an American sculptor and installation artist, born in 1952 in Naples, Texas. She grew up in Tullahoma, Tennessee. In 1974 she received her BFA from Maryland Institute College of Art in Baltimore. In 1976, from the University of California, Davis, she received an MFA. Rubins could be said is driven by formal and aesthetic concerns. As she says: “The desire to make something beautiful out of whatever you have got appealed to me.” In her work, she both extends and challenges the tradition of modernist sculpture, experimenting with the interplay of gravity, balance, form, and beauty. Her sculptural works are primarily composed of blooming arrangements of large rigid objects such as television sets, small appliances, camping and construction trailers, hot water heaters, mattresses, airplane parts, rowboats, kayaks, canoes, surfboards, and other objects. In college Rubins worked primarily with clay, creating igloo-like sculptures out of mud, concrete, and straw. Rubins avoided the characteristic permanence of ceramics with the constant disassembling of sculptures, collapsing her work back into the slip bucket or back into raw scraps. Her 1974 piece, Mud Slip, Army-Surplus Canvas and Used Cups from Coffee Machine combined found materials with wet clay and it lasted only as long as the clay stayed wet. Her creation of unlikely assemblages grew as she began to incorporate more detritus and found materials into her work. After college, Rubins started scavenging the local Goodwill and Salvation Army stores in San Francisco, where she was living at the time, collecting nearly 300 television sets for 25 to 50 cents for a piece. Rubins was privately commissioned to create her first public installation in 1981. Big Bil-Bored was a highly controversial artwork, voted Ugliest Sculpture in Chicago in a radio poll. Constructed of various discarded appliances, the installation towered forty-three feet high outside of the Cermack Plaza shopping center in Berwyn, Illinois. Soon after, Rubins was offered a commission for another public installation. In 1982, the Washington Project for the Arts funded Rubins’s Worlds Apart, a forty-five foot tall temporary installation composed of abandoned appliances, concrete and steel rebar. Her work overlooked the Whitehurst Freeway, blocks from the Watergate Building in Washington D.C. and again caused controversy.Rubins is perhaps best known for building sculptures out of salvaged airplane parts, such as an installation in 1995 for the Museum of Modern Art in New York. The piece weighed nearly 10,000 pounds. Already by the mid-1980s she had begun regularly using abandoned airplane parts in her work. For durability, she chose aluminum, fiberglass and composites rather than wood. Rubins collaborated with husband Chris Burden on a number of projects, including an installation called A Monument to Megalopolises Past and Future at Los Angeles Contemporary Exhibitions (LACE) in 1987. Boats entered Rubins’ sculptural vocabulary in 2000s. Rubins’s work has been shown internationally. Her solo museum exhibitions include those hosted by Museum of Contemporary Art, San Diego in 1994, The Museum of Modern Art, New York in 1995, ARTPACE, San Antonio in 1997, Miami Art Museum in 1999, Fonds regional d’art contemporain de Bourgogne, France in 2005, Sculpture Center, Long Island, New York in 2006, Lincoln Center, New York in 2006, and Navy Pier, Chicago in 2013. In 1993, Rubins was invited to participate in the Venice Biennale. She was included in the Whitney Biennial in the same year. Her work can be found in the public collections of the Museum of Contemporary Art, Los Angeles, the Museum of Contemporary Art, San Diego, the Museum of Modern Art, New York, the Museum of Contemporary Art, Chicago, and the Eli Broad Foundation, Los Angeles. Large scale, outdoor sculptures are on permanent display at institutions throughout the world, including the Albright Knox Art Gallery, Buffalo, and Université Paris Diderot, Paris. Over the years Rubins received numerous awards. Maryland Institute College of Art Alumni Award in 2000, Flintridge Foundation Visual Artist Award in 1997, Rockefeller Foundation Travel Award in 1993, The Louis Comfort Tiffany Foundation, Awards in Painting, Sculpture, Printmaking, Photography, and Craft Media in 1991, Creative Artists Public Service Grant, New York State Council for the Arts in 1981 and National Endowment for the Arts in 1981, 1980 and 1977. Rubins taught at the University of California, Los Angeles from 1982 to 2004 and currently resides in Topanga, California.